St. Rose School’s Advanced Math Club has been awarded the Silver Level Award for the 9th consecutive year by the National Math Club and the MATHCOUNTS. This level award is given for the submission of problem solving work a club does over the first three months of the school year. 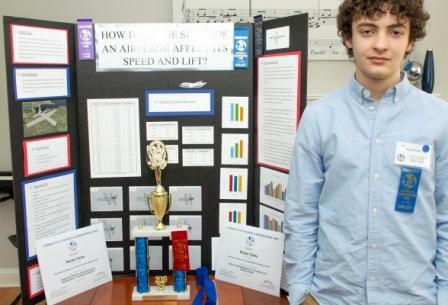 The Advanced Math Club will also compete for the Gold Level Award. Work is already underway for the the Gold Level Project which will be completed by April 2019. More than 300 Catholic and public middle schools across the country compete for these two level awards. The students have received Silver Level certificates and the school will receive the Silver Level Banner and have St. Rose School name listed on the MATHCOUNTS website. www.MATHCOUNTS.org. We are proud of the hard work of our St. Rose Mathletes! 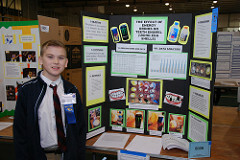 Nick Prieto was a finalist in the Physical Science category and was awarded the Lockheed Martin Physical Science Award and a CSF Medallion for his project, "The Effect of Energy Drinks on Tooth Enamel." Isabella received 3rd Honors for her experiment "Battery Life" and was awarded the UTC Aerospace Systems Engineering Award, for the Engineering Middle School category, along with a CSF Medallion. The Pfizer Life Science Award and CSF Medallion was awarded to finalist Julia Cirone for her project, "Does Ph Affect the Growth of Plants?" 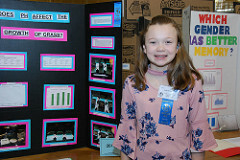 in the Life Science category.